Only nine generations after Adam's death the world had become "corrupt before God" and it was filled with violence (Genesis 6:11). It was so wicked that the Lord "repented... that he had made man on the earth" and vowed to "...destroy... from the face of the earth; both man, and beast and the creeping thing, and the fowls of the air." (Genesis 6:6-7) Amidst all this wickedness Noah remained faithful and found "grace in the eyes of the Lord." (Genesis 6: 8) God makes a covenant with him that he will save him, his wife, his sons, and his son's wives from the destruction. He provides Noah with instructions on how to build and ark that will carry him, his family and all the creations of the earth to safety (Genesis 6: 13-22). It is through her son Shem's posterity that the Jews came, and eventually the Savior Jesus Christ. In the apocryphal Book of Jasher (5:15) it says that her name was "Naamah", the daughter of Enoch. Jewish tradition also says her name was Naamah but that she was the Naamah mentioned in Genesis 4:22, the daughter of Lamech and Zilah and sister of Tubal-Cain. The Greeks called her "Doris" the wife of Nereus (Noah), the "wet one". She probably would have had to help take care of all the animals that were on the ark. God commanded Noah to take 7 male/female pairs of all the clean animals and fowls (14 total of each animal) and 2 (one male, one female) of the unclean animals (Genesis 7:2-3). That would have been a whole lot of animals to be cooped up with for almost a whole year! God also commanded them to take all the food they would need for the animals and themselves onto the ark (Genesis 6: 21). I read one story that claimed Noah's wife was the one to gather all the plants and preserved the ancient wisdom of the earth. Even though we don't know her name, or know much about her, this woman was one of the most important and influential women in the history of the world. She, like Eve, was the mother of the human race. It is through her that all the nations of the earth after the flood were born. In fact, her and Noah's story is very similar to the story of Adam and Eve-- just a bit backward. Because of their sins Adam and Eve are removed from a pure, perfect, new world and taken to a corrupt, fallen and wicked world. Compare this to the story of Noah and his wife. In a way she and Noah were a second Adam and Eve being reborn into a clean and pure world. I think there story represents the potential that all of God's creations have for rebirth and redemption. Each of us is living in a fallen, wicked and corrupt world but through our righteousness God promises us that we will be able to be "reborn" into his kingdom where we will inherit eternal glory (Moses 6:59). The story of Noah and his wife illustrates how God will redeem his righteous people from the fall, how he will deliver them and how he will provide for them a world that is pure and clean. It is also significant to note that it isn't just the animals that go into the ark "two by two" but that the humans also go into the ark in husband and wife pairs. I think that this teaches us that God's work is done by pairs, a husband and a wife, and that it His desire that we come unto him "two by two". Another thought I've had about this story is that the ark is representative of the temples we now have on the earth. Inside the temple a man and woman are sealed together, "two by two", and given great promises which are dependent upon their faithfulness. The temple is a place of safety and peace amidst a world that is filled with violence, wickedness and corruption. In a way the temple is our modern day ark, which carries us through this through this fallen world and gives us a glimpse of the clean and pure one we will enter one day. Noah's wife must have been an incredible woman. Her example gives me hope and strength as I too am attempting to raise a family and be a righteous wife and woman in a wicked and violent world. God intends for all his creations to come unto him "two by two." How did she raise righteous son's amidst all that wickedness? How did she keep them unspoiled by what was happening around them? 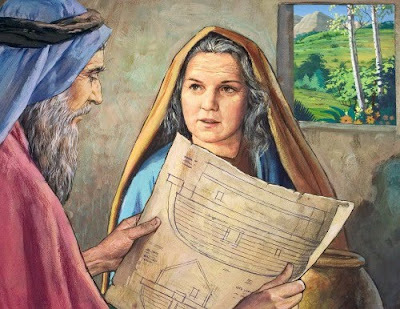 In what ways did she help with the creation of the Ark? Did she help build it? Care for the animals? Was she always supportive of Noah or did she ever doubt him? Your assertion that the story of Noah and the ark is like the fall but in reverse is very intriguing. Great thoughts in this post! I wonder how she felt about leaving all her daughters behind with "men of the world". That must've been a hard thing to do.